First things first: head over to the Flasher.js releases page and download the latest version. We have lots of options for you - you can run Flasher.js on Linux, Mac, and Windows (both 32bit and 64bit). You can even compile the source yourself if you&apos;re feeling brave. On Windows, you&apos;ll be downloading an installer, once it&apos;s downloaded, open it and it&apos;ll install in your Start Menu. On a Mac, you&apos;ll be downloading a disk image (.dmg) file. Double-click it and drag the Flasher.js icon over to your Applications folder. If you&apos;re on Linux, you&apos;ll be downloading a Debian package (.deb). Double-click it to install. Before you open up Flasher.js, you may need to install some drivers for your board. Luckily, we&apos;ve put together a little table with the related links for you on our Compatible Devices page. Go ahead and go check it out and install the drivers if you need them. We&apos;ll be here when you get back! Flasher.js will attempt to auto-select the port for you, but you can double check it. On Windows, these are going to look like COM3, while on Mac and Linux they will be more like /dev/ttyUSB1 or /dev/cu.usbmodem150. Next, pick which runtime you want to flash on your device. We&apos;ve got multiple versions of Espruino, as well as Mongoose OS (formerly Smart.js), thingsSwitch (our tool for talking to the Amazon Echo), and even MicroPython! 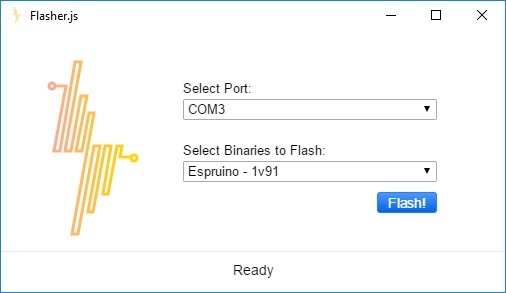 If you&apos;re not sure, and you just want to get going on some of the tutorials you&apos;ve seen elsewhere on thingsSDK, just pick the latest version of Espruino. And now - the moment you&apos;ve been waiting for - click the Flash! button. Flasher.js will go download the appropriate binary for you, prepare it, and flash your device - all in one step! On most devices, you should see an LED blinking during the flashing process. This should only take a few minutes, and a notification will pop up indicating that flashing is done. That&apos;s it! You&apos;re all set to start on the rest of the thingsSDK toolchain and build your project.